Last in the lineup of cookie crazy. Saved the best for last. I love cookies loaded with nuts. 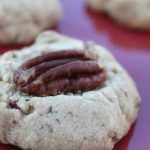 Grant’s Grandmother Lauder’s Christmas Pecan Shortbread Cookies. Probably my all time favorite. Versatile too (see tips bottom of page). So, so, good. Simplicity at its best. Sugar, butter, flour. A little cornstarch and nuts. Love the way recipes used to be written: “Bake in a slow oven until done”. Typed out, on a real typewriter, using carbon paper. If you are saying “carbon whaaa?” you are probaby young enough to be my kid 🙂 or maybe you are my kid. Cream together butter and brown sugar until light and fluffy. Add 1 cup chopped nuts. Measure and sift together flour, cornstarch and salt. Mix dry ingredients into butter-sugar mixture in mixing bowl with mixer set on lowest setting, or use hands and large spoon to mix. Turn out to lightly floured surface and knead in flour until cracks appear on surface of dough. Using small 1 inch scoop, make balls of dough. Place on lightly greased cookie sheet. Flatten slightly with fork and press pecan into center of cookie. Bake at 275 for about 20-30 minutes or until cookie is light golden color and cooked through. -If the dough is too dry after mixing in dry ingredients and will not hold together, add 1-2 tablespoons milk or water.-You may also roll out this dough and cut into strips and bake.-This is a firm, crunchy cookie. perfect for dipping in hot cocoa of coffee.-The cookies may be rolled into balls and baked without flattening. After removing from oven, roll in powdered sugar. 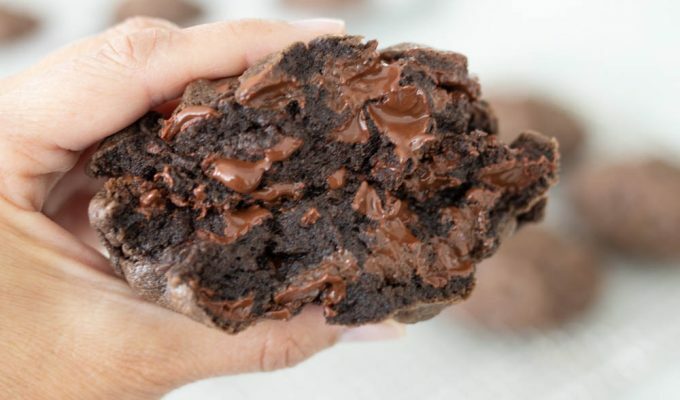 Let cool, then roll in powdered sugar again.-Leave off the pecan on top and dip half of the cookie into melted chocolate, or melt chocolate and drizzle on top of baked and cooled cookie.-These cookie freeze well. They also keep well in a cool place, covered, for about a month. Those look and sound Y.U.M. Mom just bought a hugeeeee thing of nuts and I was wondering what type of food I could make with this. Such a beautiful looking cookie! Yum, I will make em tonight:) I was actually wondering if you could do the powdered sugar thing. Do they taste kindof like mexican wedding cookies maybe. 🙂 Love these cookies. Thanks Si! Lis,Yes, if you dip the cookies in powdered sugar, they are just like Mexican Wedding cookies, aka "snowballs" to some peeps. Kimi, I'm bringing you some, soon. These look DELICIOUS, but the name 'shortbread' in the title intimidates me for some reason. Perhaps I'll be brave and try them. Tiffany. Do not be afraid. These are the easiest cookies. Ever. Great to se eyou too! Merry Christmas!